Former President George H.W. 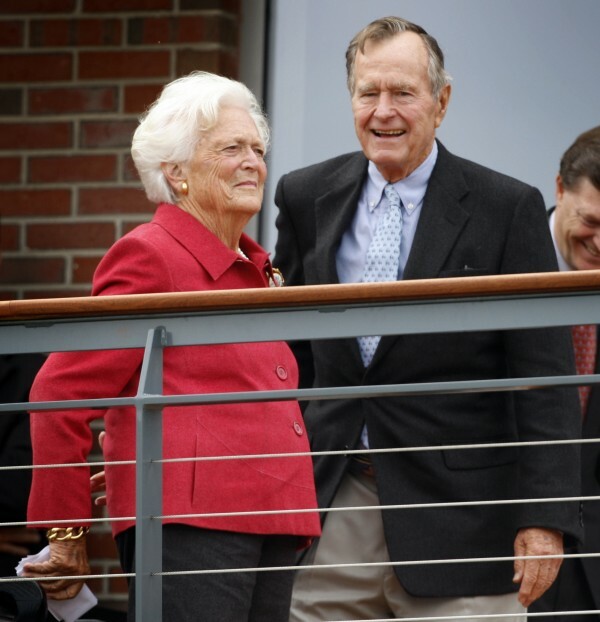 Bush and his wife Barbara Former attend a dedication in October 2008 for the George and Barbara Bush Center at the University of New England in Biddeford. The Bushes are planning to ride out Hurricane Irene at their summer home in Kennebunkport. KENNEBUNKPORT, Maine — Former President George H.W. Bush and his wife Barbara are planning to ride out Hurricane Irene at their summer home in Kennebunkport. But Jim Appleby, spokesman for the Bushes, says plans are made to move them to an inland location if the surf and wind become too rough at their Walker’s Point home. Appleby says the Bushes want to stress that they are going to follow what the emergency management officials direct them to do. Meanwhile, in Augusta, Gov. Paul LePage will conduct a briefing Saturday afternoon with Maine Emergency Management Agency Director Robert McAleer at MEMA headquarters about Hurricane Irene and its potential impact on Maine. The National Weather Service predicts sustained winds of 50 mph, with gusts to 60, and 20- to 25-foot seas offshore.